Whether you are planning a large, elaborate event for many guests, an intimate gathering for a few close friends or a private ceremony for bride and groom, Sandals and Beaches resorts offer all inclusive destination weddings packages to suit any budget and most any bride's style. The Sandals WeddingMoon® is your customized all inclusive destination wedding and Caribbean honeymoon package. The Sandals Ladies are 2 of only 75 people in the US named Certified WeddingMoon® Specialists by Sandals. We are highly trained by the Sandals Wedding Department to guide couples through the wedding planning process and ensure that their destination wedding experience is exciting and fun. As your WeddingMoon specialist, my job is to walk you step-by-step through designing your custom destination wedding, coordinate your guests' travel, and plan your romantic Caribbean honeymoon. The first step is to decide at which resort you want to get married and to book the bride and groom's stay. There are 13 different Sandals resorts and 4 Beaches resorts spread across 6 islands of the Caribbean. I have personally visited each one, and I will take time to get to know you and your unique preferences. Then I will recommend a couple of the resorts that I think best suit your style and personality. Depending on whether there will be children attending the wedding and how involved they will be with the wedding party, I will suggest whether the bride and groom stay at a Sandals resort or a Beaches resort. The wedding ceremony will take place at the resort where the bride and groom stay. Wedding guests may stay at a different Sandals or Beaches resort if necessary. So, first we will choose your resort and your travel dates, and we will book your trip. Sandals only requires a $400 deposit to book the trip. Next, I will book your ceremony day and time. Each of the islands have different requirements for how long you must be on the island before you are allowed to marry. I will go over these requriements with you, and we will determine what day and time you would like to have your wedding. Then, I will work with the Sandals Wedding Department to secure your ceremony time. 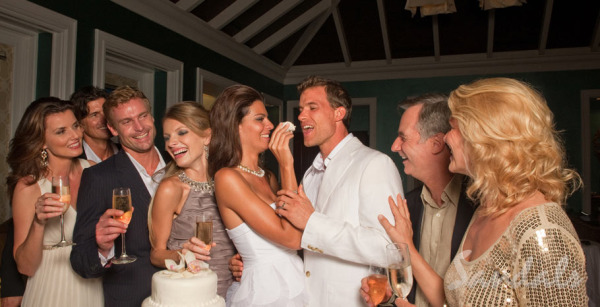 Each resort only schedules one wedding per hour to ensure that you will have the staff's full attention. You may choose to hold your wedding ceremony during the very romantic twighlight (just before sunset) hour. Sandals does charge a small premium for this frequently requested ceremony time, but it is the perfect way to ensure your wedding photographer catches some photos of your gorgeous dress against the brilliant colors of the Caribbean sunset. There are several methods to choose from for designing your Sandals wedding ceremony and reception. Your wedding day at Sandals can be as customized as you wish. I will explain the design options in my next blog post. If you will have wedding party members and/or wedding guests traveling with you, your group may qualify for special perks and amenities. Depending on the number of rooms booked in your group, the bride and groom could receive a complimentary room upgrade, manicure for the bride, massage for the groom, upgrades to the wedding reception and more. Sandals will also include perks for the wedding group members such as private group check-in, pre-wedding group celebration dinner and a commemorative gift for each member of the group. Whether your group is large or small, you can turn the stress of coordinating your family and friends' travel arrangements over to me. Please, give me any preferences or requests that you have regarding where your family and friends stay. Then, just tell your family and friends to call The Sand Lady to make their arrangements to attend your wedding. 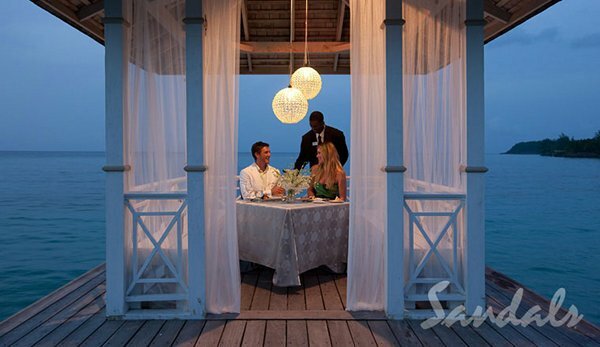 You may also want to take advantage of the Sandals Bridal Registry. Once you have planned your trip, you can register it just like you would register for home goods at a retail store. You will register for items such as monetary contributions toward your trip as well as "extras" that you would like to add to your Sandals honeymoon. You may choose to register for off-site tours such as a sunset catamaran cruise, horseback riding on the beach or zip lining through the jungle. Or you might register for spa treatments such as a couples massage. You can even register for a private candlelight dinner for two under the stars. Whether your friends and family will be able to attend your wedding or not, they can contribute toward your honeymoon. Look for the next entry in this blog series "Your Ceremony, Your Style." It is all about the many options for designing your unique destination wedding at Sandals or Beaches. If you're considering a Caribbean destination wedding, just click below to let me know that you'd like more information on how we plan your dream wedding!